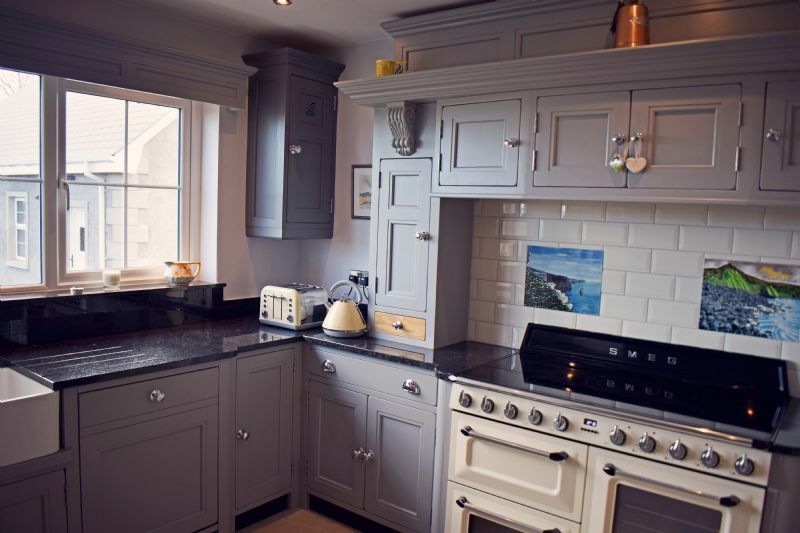 June & Walter’s gorgeous kitchen is truly the heart of their home. 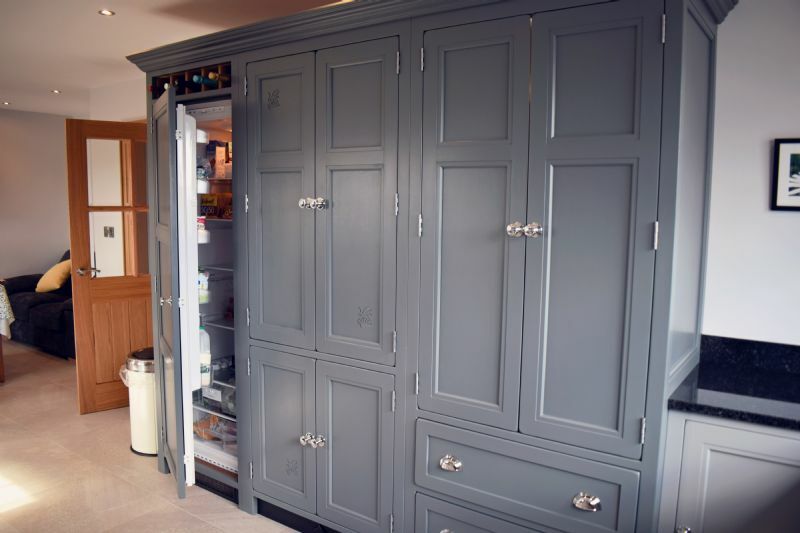 They spend most of their time in there, working, relaxing, and having friends over. 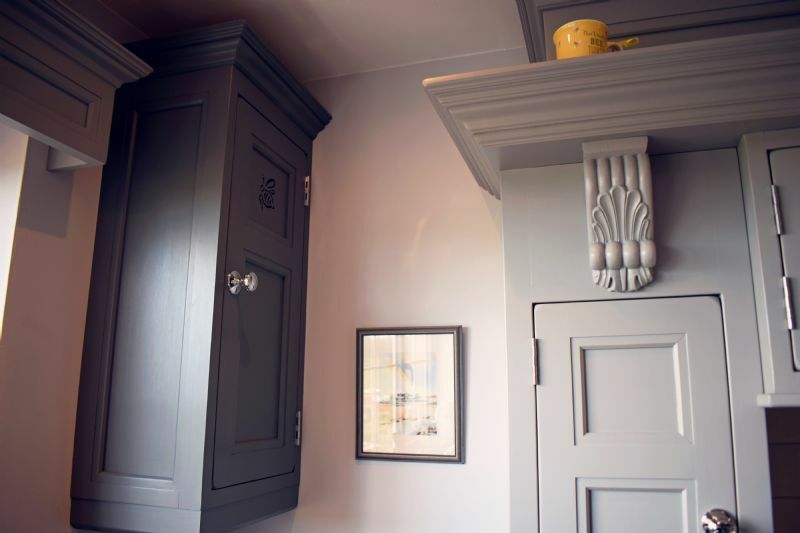 So they wanted a space that would stand the test of time, have a high quality look and feel, and be unique to them. 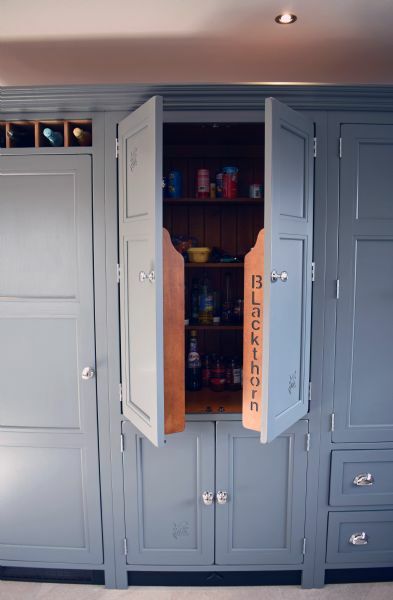 They had searched several kitchen companies before they found the one right for them- Blackthorn. 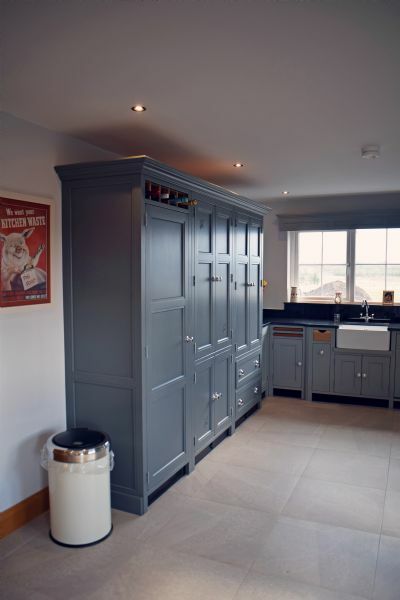 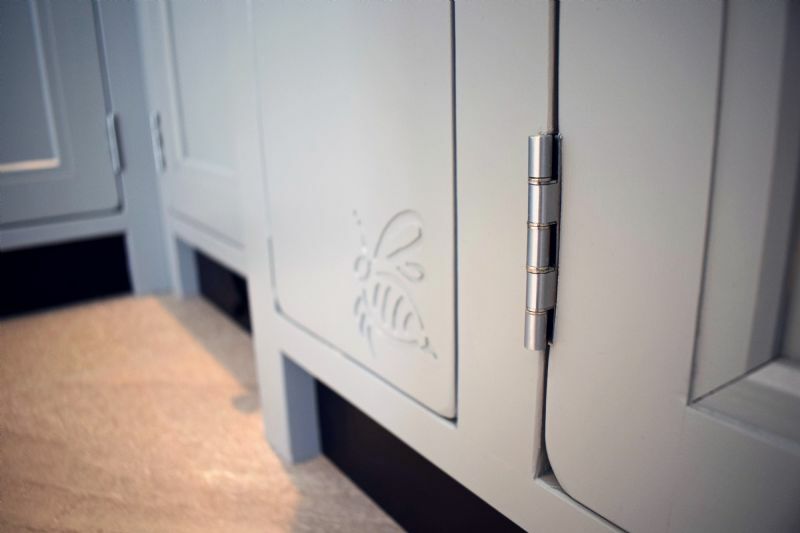 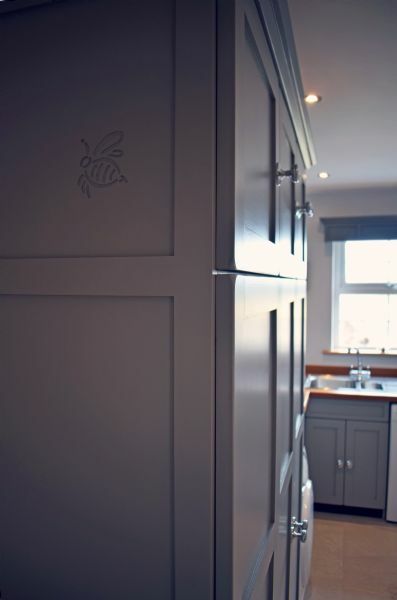 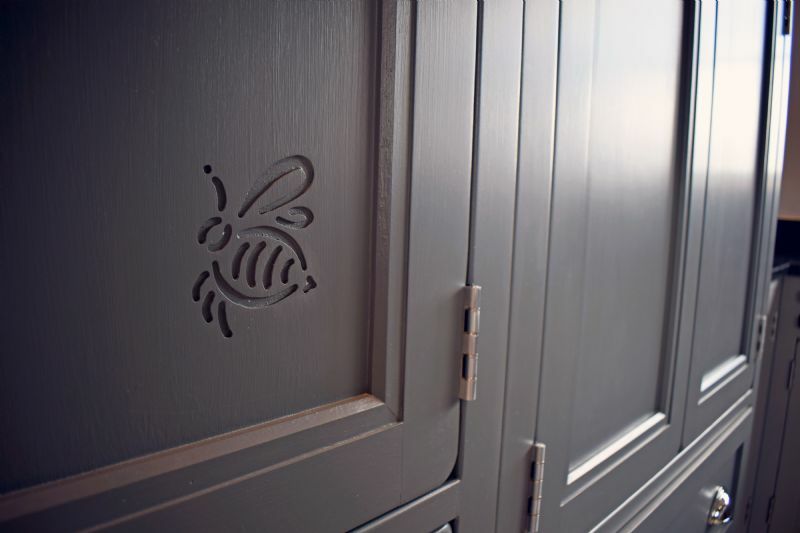 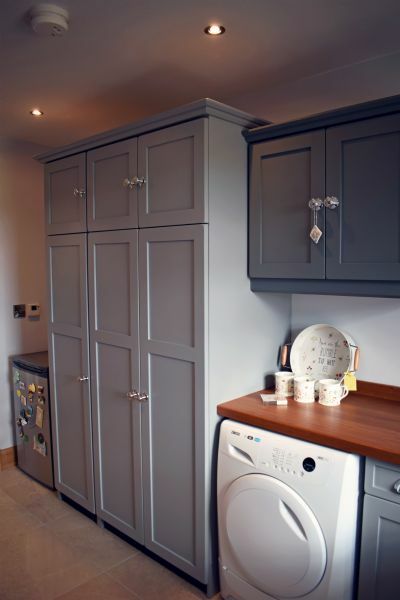 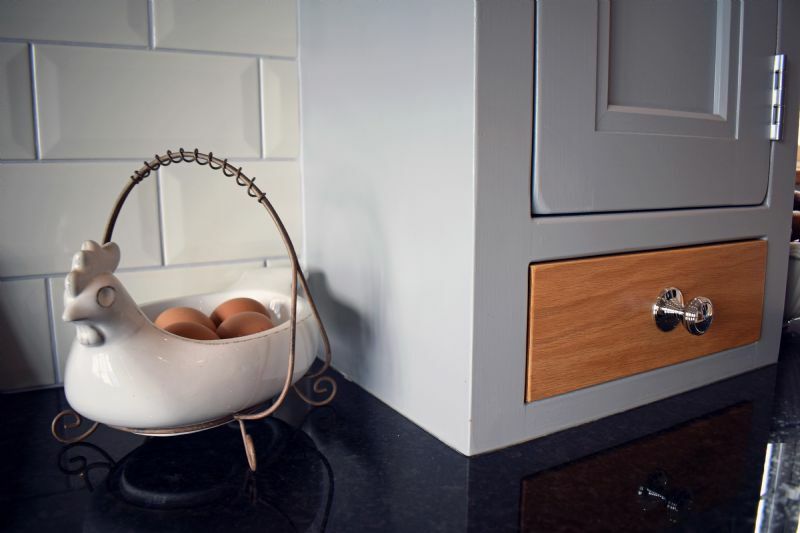 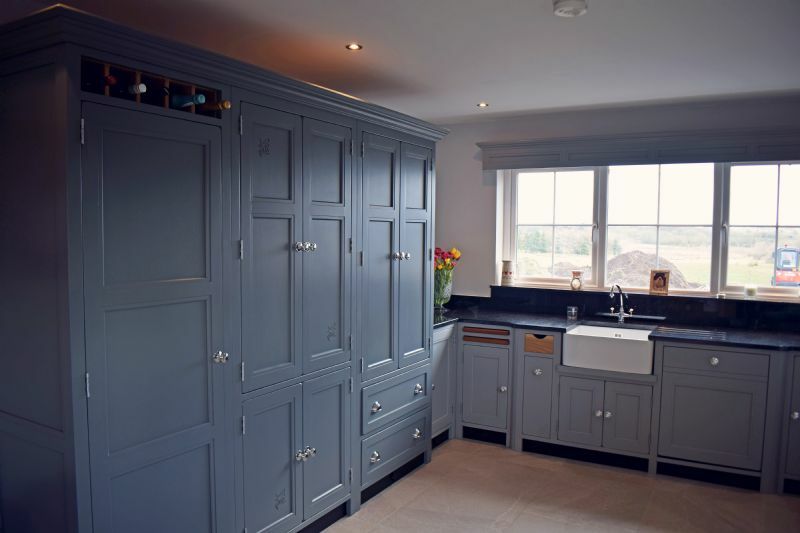 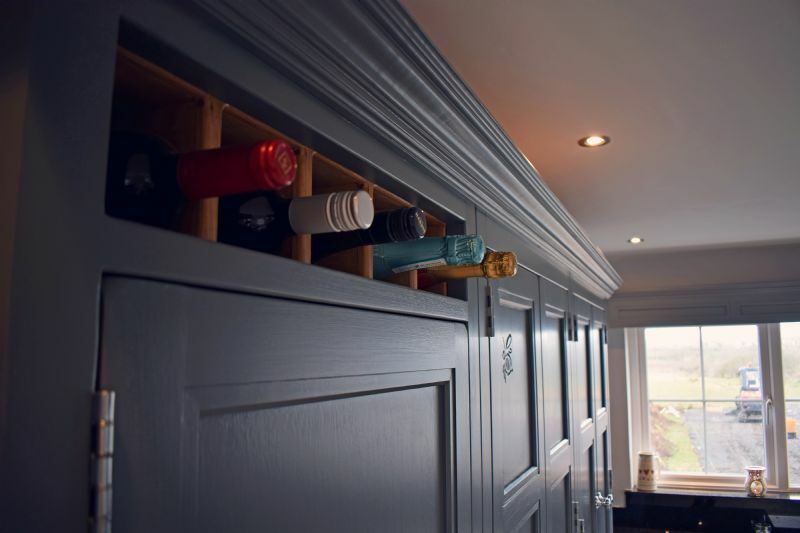 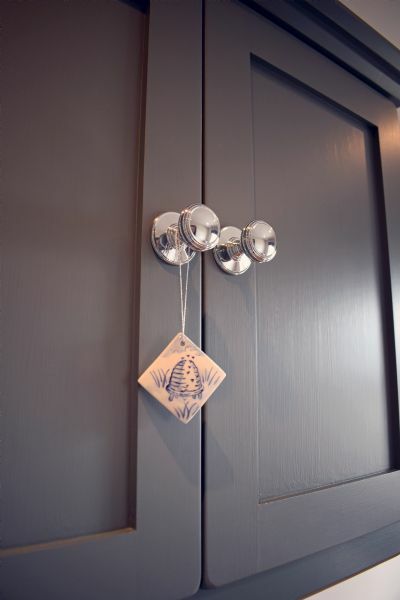 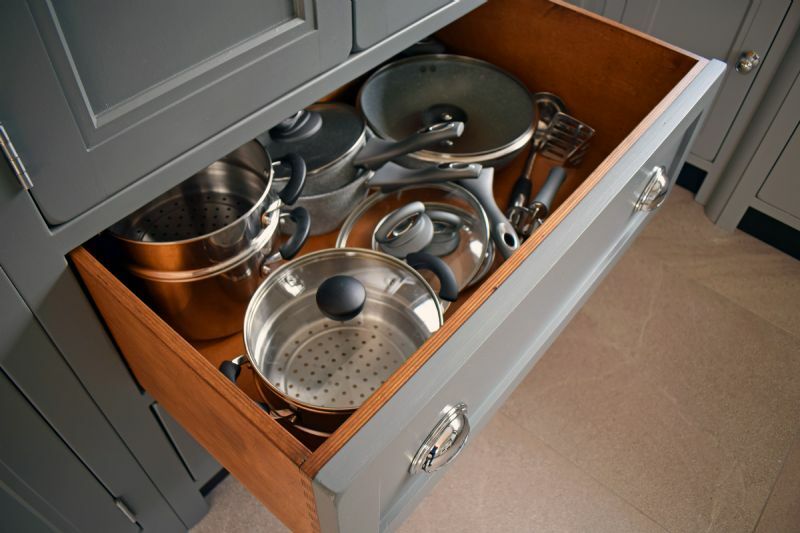 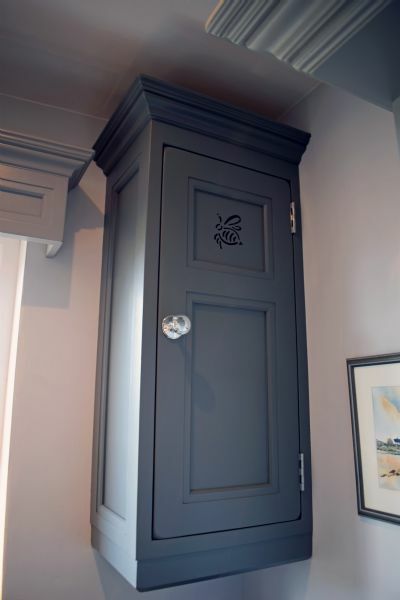 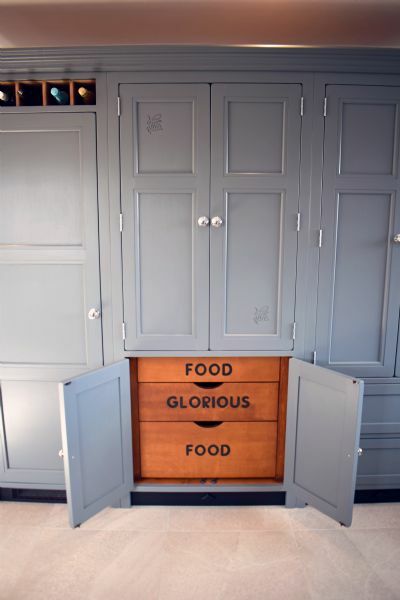 As avid beekeepers, they loved that Blackthorn could add that personal element to their kitchen, as well as tailor-made cabinets that gave them plenty of storage. 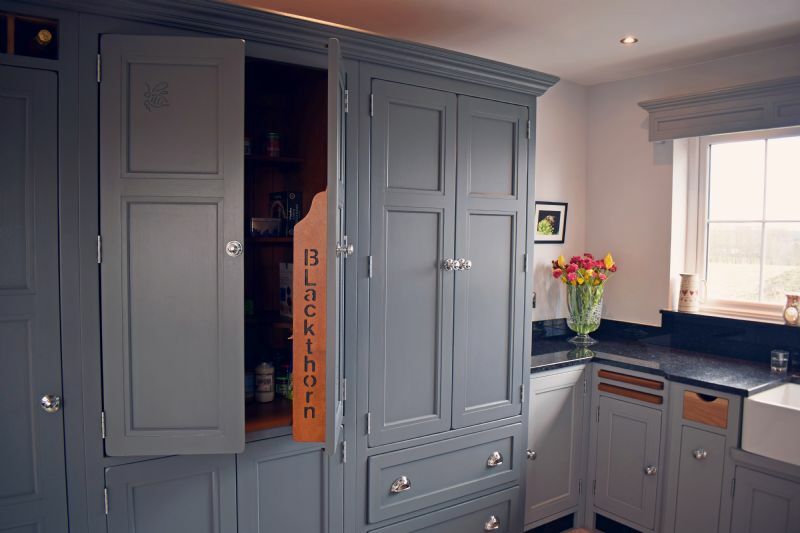 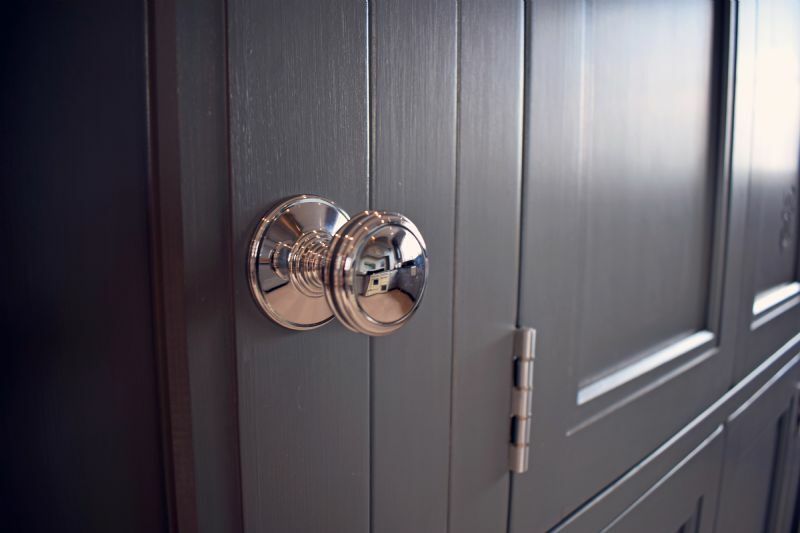 Walter told us they really liked Blackthorn’s friendly and personal touch, and that there’s nothing they don’t love about their kitchen and utility (and bathroom vanity units). 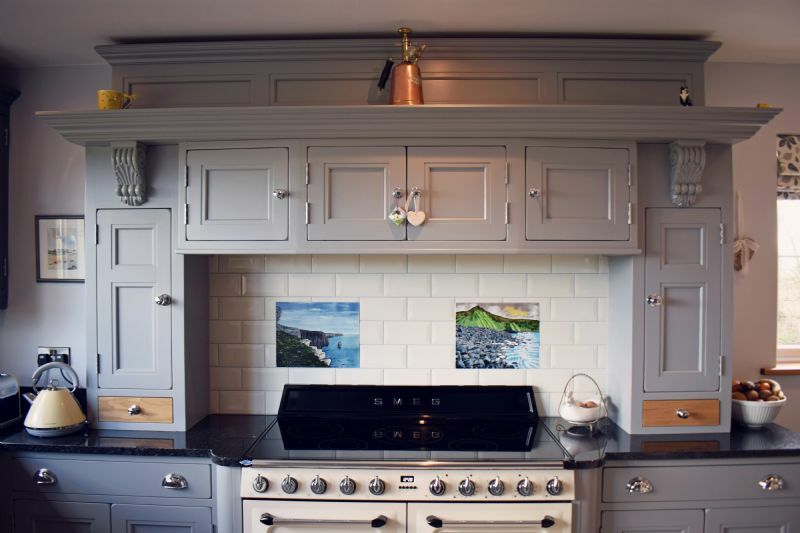 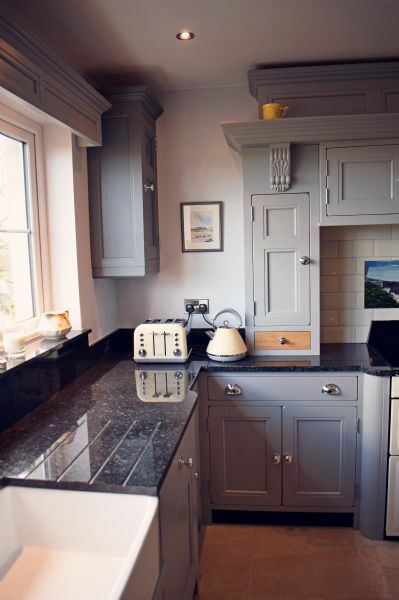 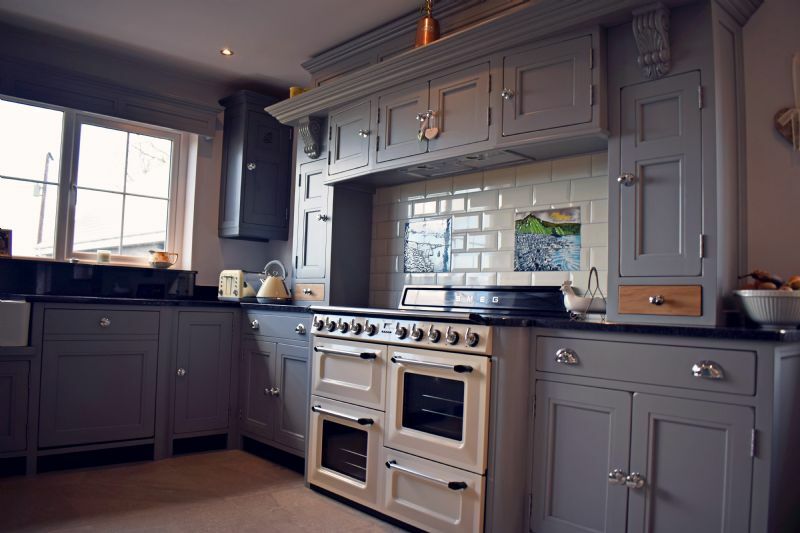 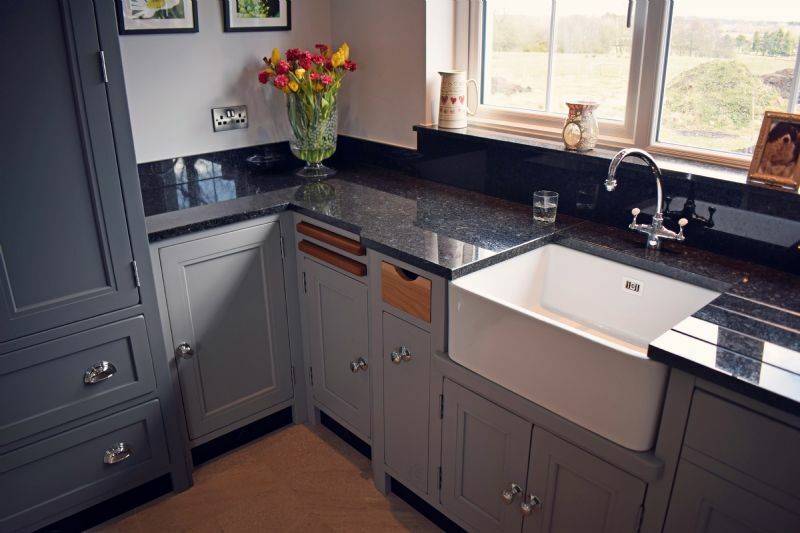 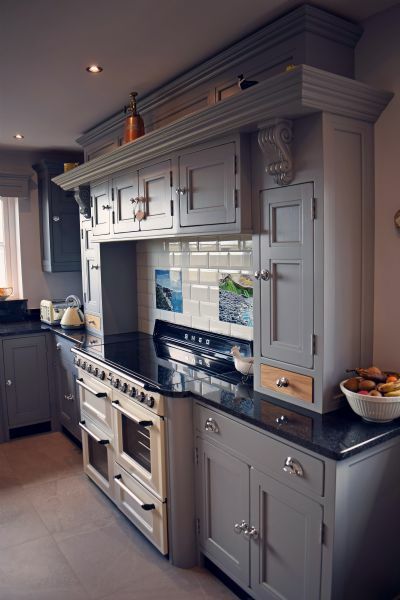 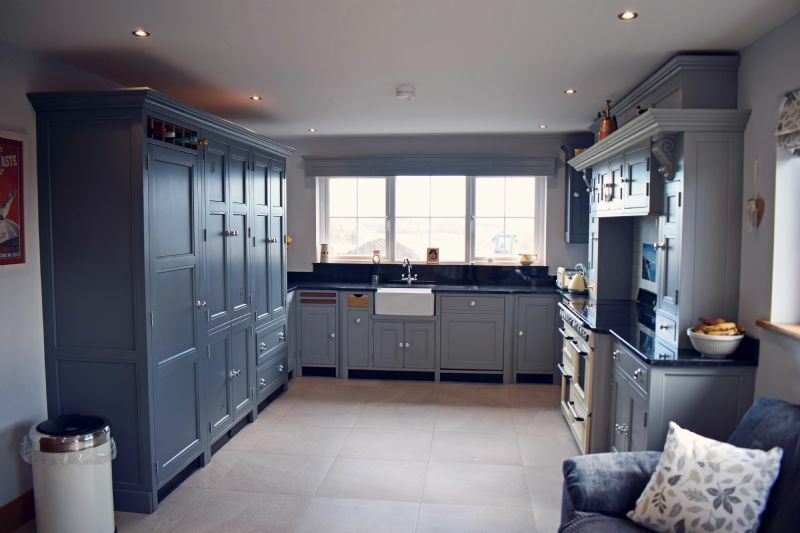 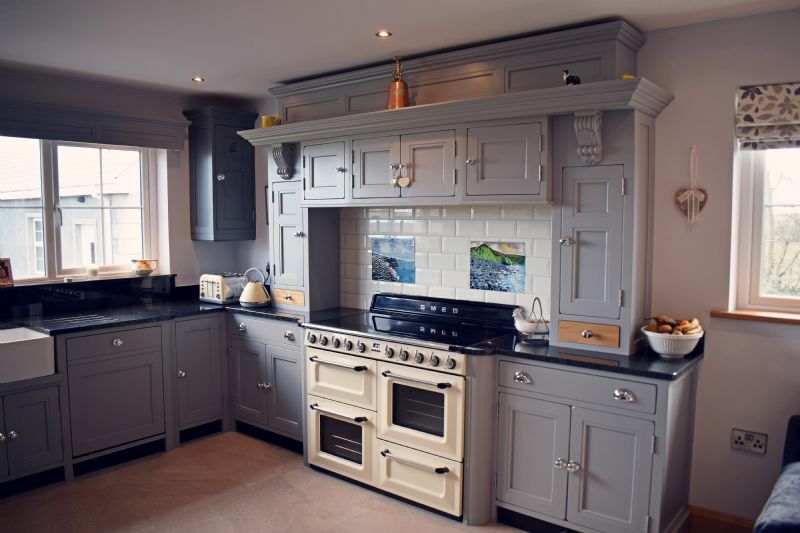 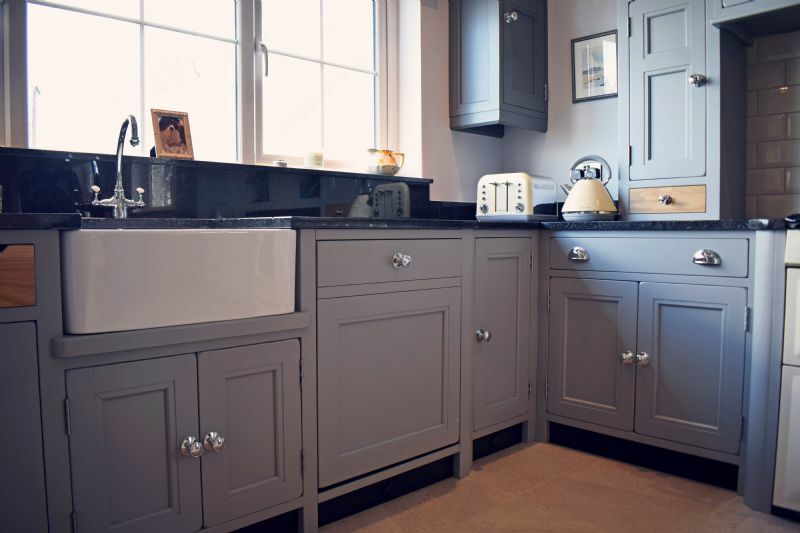 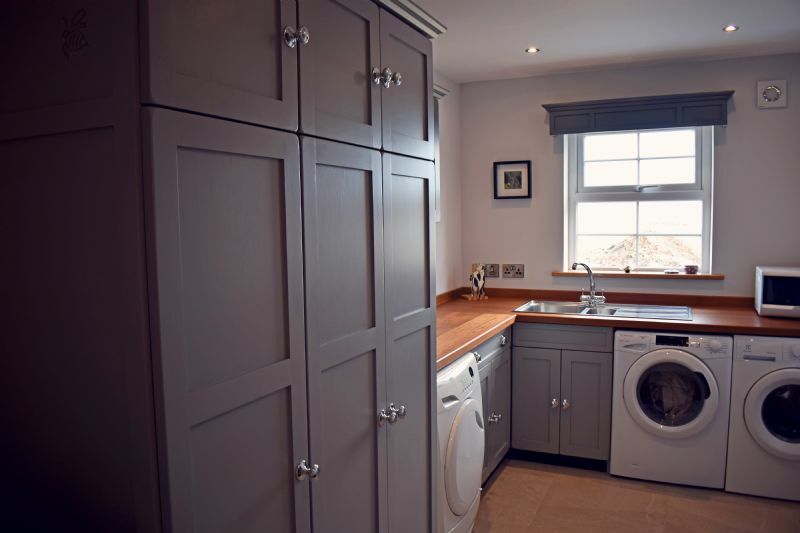 Walter and June’s kitchen is handmade from solid wood and handpainted in Farrow & Ball Manor House Gray (main units), and Scree (darker cabinets on the left-hand side and tea cabinet), with fine highlights of polished oak scattered throughout. 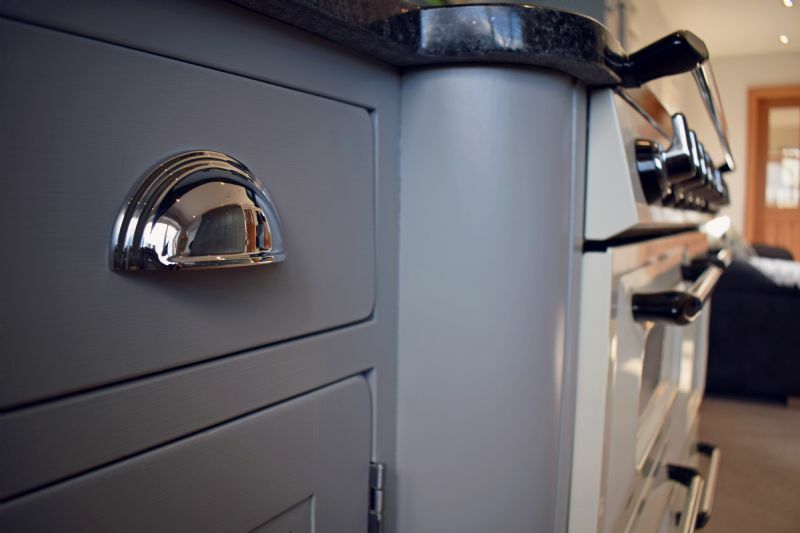 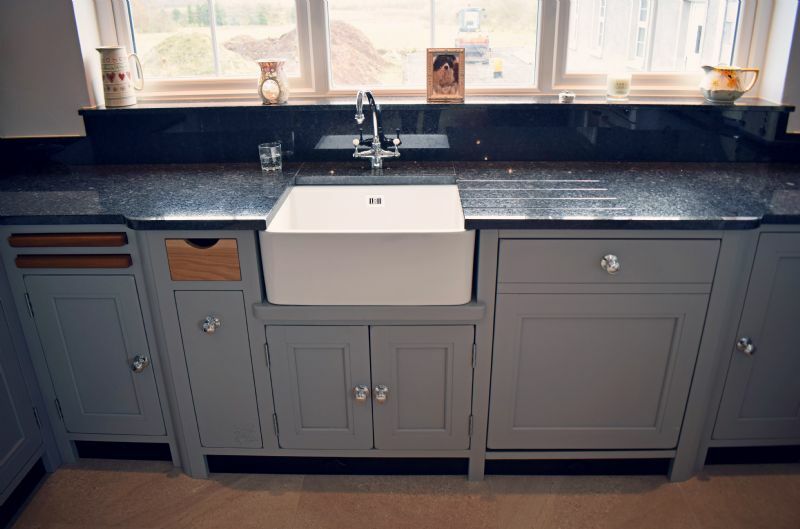 The kitchen features a Belfast sink, with Perrin & Rowe Etruscan taps in chrome, which perfectly complements their chrome handles. 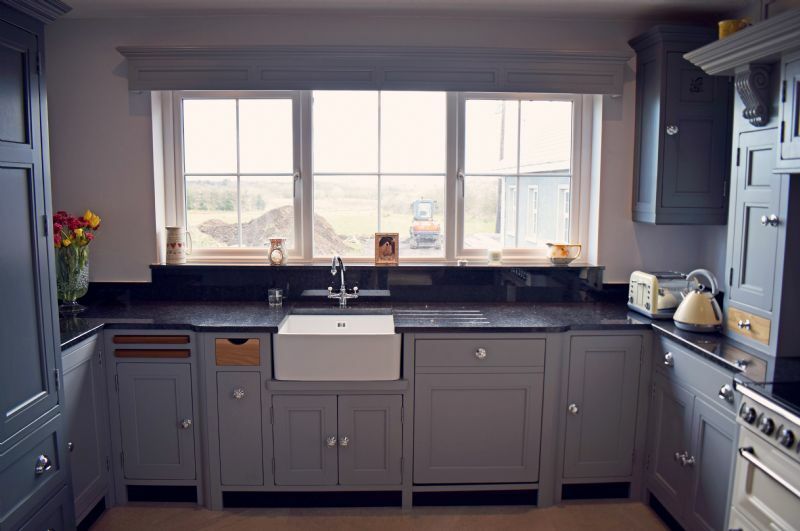 With the beading and cornice styles, as well as the use of a tall bank of units, June and Walter’s kitchen is reminiscent of a Victorian townhouse kitchen, combined with the charm and warmth of a farmhouse kitchen. 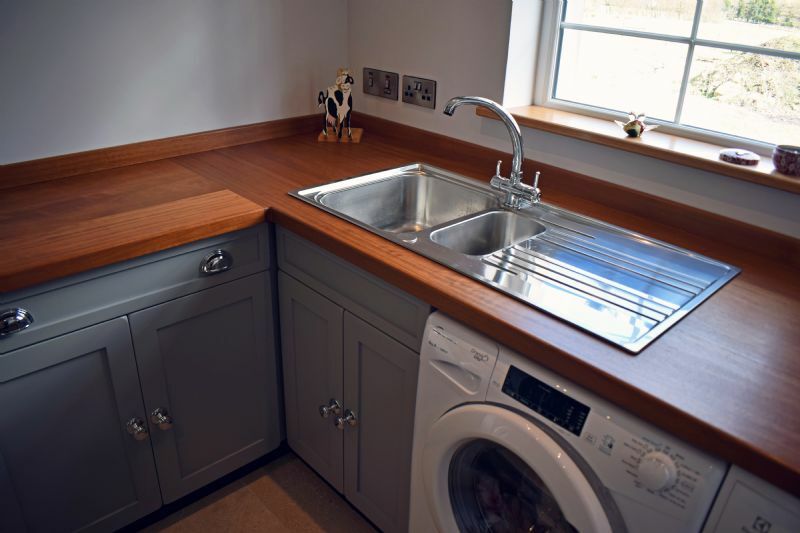 Their utility room features on-frame cabinets in F&B’s Manor House Gray & Scree with beautifully burnished Iroko plank worktops. 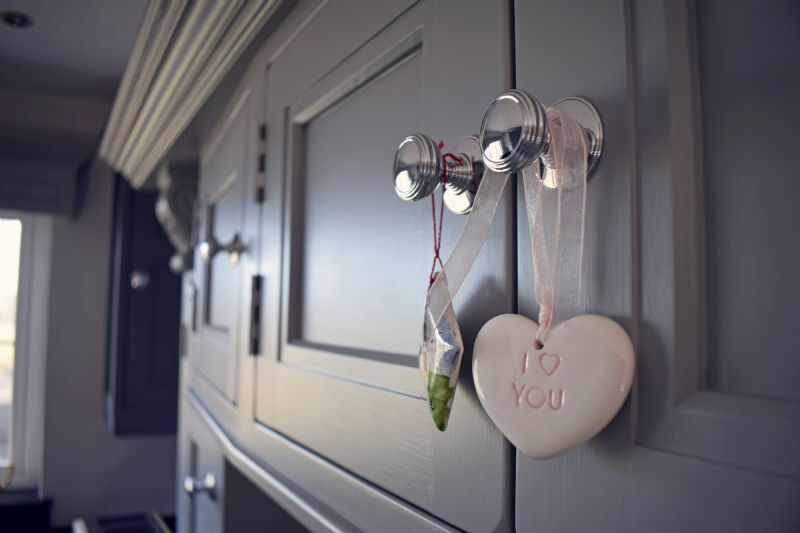 A big thank you to Walter and June for welcoming us back so warmly to take these pictures.